If you are looking for a game to get your 3rd person sci-fi shooter hook equipped with weapon upgrades, a need for wanton explosions and a storyline of betrayal of the highest degree, Rogue Trooper Redux has you covered. Game Development company Rebellion acquired 2000 AD and brought the comic book Rogue Trooper back to life in the video game world in 2006. It was released on several platforms including PC, Xbox & PS2. It has been given a reboot and a modern makeover to bring the game to today’s standards and to the latest gen of consoles including the Nintendo Switch hence the name Rogue Trooper Redux. Rebellion was also behind the development of the Sniper Elite Series and Alien Vs. Predator. 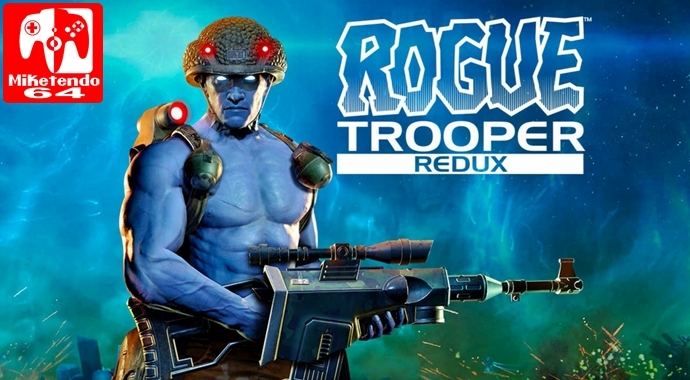 Rogue Trooper Redux tells the story about a Genetically Enhanced Super Soldier named Rogue who is a GI (Genetic Infantryman) that was created by Souther Scientists to fight against their enemies, the Norts. The reason behind their creation was to create a genetic being that was immune to the poisonous gases of Nu-Earth and to other toxins, poisons and even acids which would give them an advantage in the war against the Norts that relied heavily on their cumbersome Life support equipment to survive in the harsh conditions of Nu-Earth. After a military operation gone bad, Rogue is the lone survivor of the Quartz Zone Massacre who goes AWOL to find the Traitor General who betrayed him and his fellow soldiers by informing the Norts about the impending assault. After removing the Biochips of his recently deceased comrades and inserting them into his Weapon, Backpack and Helmet, Rogue is reunited with his buddies, Gunnar, Bagman & Helm. Together again, Rogue and company set off on an unauthorized mission to bring the Traitor General to justice and enact revenge for the massacre of his fellow soldiers that perished in the Quartz Zone. Though many may criticize graphics as not being the greatest. I choose to look beyond that and am pleased with the aesthetics of the game. The overall appearance of the game looks just as good on TV as in Handheld mode and most of the time I play it in handheld mode anyway. The effects of film, brings the comic book to life and feels like watching an animated movie. The online multiplayer mode is a fairly enjoyable romp but can suffer from some incredible lag at times so you really do have to have a good internet connection to really enjoy it. Gameplay is as fun as it can be for a third-person shooter, though the levels are quite linear and gives you a single objective to complete before moving onto the next one. How you deal with enemies is up to you however and you can dispatch them in any way you feel fit. Want to take out groups of enemies with a bunch of micro mines? go for it. Want to go in gung-ho with the machine gun? Great! Prefer taking the Sniper rifle out for a spin and dispatching your foes from a distance? Go for it. There is no real ‘wrong’ way so you can create your own fun whilst working your way through the main campaign. You don’t get all of these weapons from the beginning though and you do have to manufacture them after given the prompt to do so. Of course, these are all optional but some special skills and weapons to come in handy at times in order to take down those pesky carriers or armoured brutes. Weapons, ammo and med packs have to be crafted by using salvage that you have collected off of dead soldiers and in secret piles. Though salvage can be quite abundant, careless use of depleting ammo will have you constantly using up the last of your salvage which you may have been saving up to get the next upgrade or even a vital medi-pack. Where Rogue Trooper comes unstuck is its controls. Both ideal yet not ideal, the movement controls are fine but the aiming can be sluggish when using the sniper rifle or weapon armaments. When up behind cover, you are giving a couple of prompts between blind fire or aimed fire and can dive between one cover to the next but you can’t just back off of the cover and sometimes you can’t fire over it either, with your bullets plowing into your cover instead of where your reticle is actually pointing to. The L & R buttons are incredibly sensitive, with the L button being the biggest culprit as it can drop a micro mine instead of throwing it and can’t be picked up. You have to then abandon your position and detonate it before you can use the micro mine again and this can give away your position to enemies and bring them down on you like a ton of brick which is not what you want when you are trying to be stealthy. Weapon selection can be awkward at times as well as it is done in real time by pressing the X button and if you are trying to cycle through weapons in a hurry, you may have a devil’s job trying to find the weapon you want whilst being used as a moving target for Norts to practice on. Never playing Rogue Trooper before this iteration, The game has an interesting enough story, so much so that it has won BAFTA’s for best story. There is more to be offered by this game than it lets on. The main campaign is a good time sink but the replayability really lies in it’s multiplayer. You can find friends to play with and then enjoy multiplayer co-op together and even if you don’t have friends, you can join games with complete strangers. It must be said though that as great as the game looks and plays, the controls for the game can let it down a bit which is a bit of a shame. Still, the music and sound effects do well to set the tone of the game so you can still enjoy the story of Rogue Trooper and really get a feel of involvement even if sometimes it can take an age to line up that perfect sniper head shot. 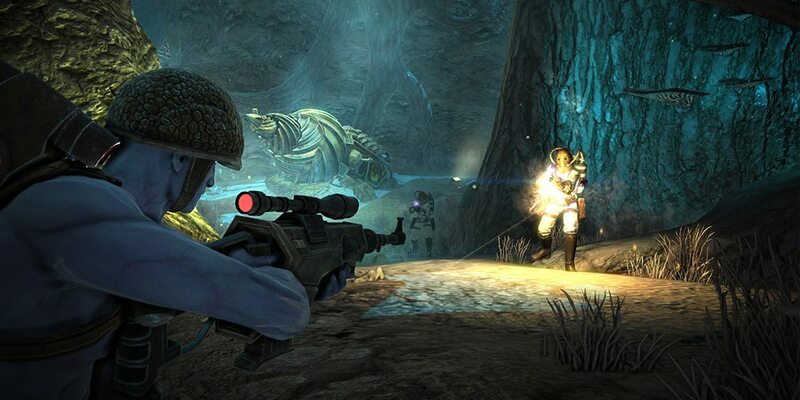 Rogue Trooper Redux is a Sci-Fi geek’s dream. Full of futuristic fantasy with plenty of action and a story so compelling that it is no wonder why the Comic was given the opportunity to be developed into a video game. My love for all things British also gives me great appreciation on what my tiny island nation can achieve and produce. Rebellion and 2000AD have brought a piece of British comic history back to life (though many have probably never heard of Rogue Trooper, let alone it originally being a comic strip except those that may have actually read the Judge Dredd comics) and bringing it to the Switch is the most ideal way to enjoy this revamped classic, especially on the go.